This tourist mecca has something for everyone, but the sheer number of activities and attractions can feel a little overwhelming. But it's possible to make even a quick trip feel like a gratifying getaway  it just takes some strategizing, a handful of helpful websites and inside tips from local travel pros. Many hotels have shuttles to and from the theme parks, but if time is of the essence, renting a car is probably a better bet unless you plan to stay on-site at a theme park and spend all your time there. The main thoroughfare is Interstate 4, which can get packed. International Drive, which runs roughly parallel to I-4, is another option, but it can also fill with theme park and local traffic. Dodge the gridlock on one of two alternate routes, suggests local blogger Casey Wohl, author of GirlsGetawayGuide.net: On the southwestern edge of town, you can take state route 429. To the east is state route 417. 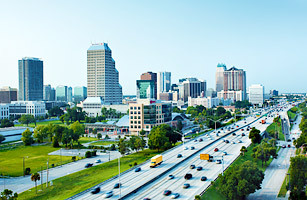 Both are toll roads that loop around Orlando and can help you avoid wasting vacation hours stuck in traffic. Watch where you buy gas to avoid getting sticker shock. "It's more expensive within the vicinity of the themes parks and the airport," Wohl says. "If you're en route, try to find gas that's not near those." That said, if you don't drive or are just feeling intrepid, you can travel via the I-Ride Trolley, which runs every 15 minutes between Universal, SeaWorld and International Drive.